Put a divider in your tank that easily allows water to flow through it! Measure your tank. Cut a piece of plastic hardware mesh or craft mesh to the size needed. 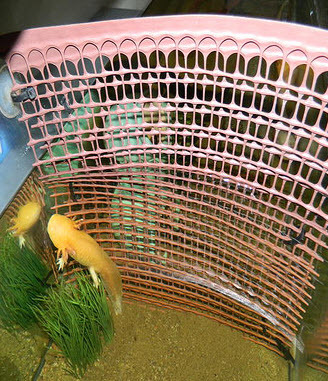 Ensure that the holes are too small for your axolotl or other pet to fit through, and cut a second piece of the net for a second layer if needed to create smaller holes. Get suction cups that have a hole in the nub and secure the suction cups onto the sides of the net with zip ties. Cut off the excess zip tie ribbon and consider tucking pieces of moss between the two net layers. Use sandpaper or a nail file to sand off any sharp edges, then rinse the net before putting it in your pet’s tank.